On Thursday, January 26, a grim announcement ticked across the news wires and internet but was buried to the point of near-obscurity by the blitz of executive orders and incessant accusations by the new administration of widespread voter fraud and media manipulation of inaugural crowd reporting. On November 14, 2016, an interview of Noam Chomsky— linguistics scholar, political philosopher, and public intellectual—by C. J. Polychroniou was published on the website of political news outlet Truthout. In the interview, Chomsky made the assertion that the Republican Party had become the most dangerous organization in world history. The assertion expectedly drew criticism for being preposterously partisan hyperbole, and some other things not quite so nice. Chomsky’s point was made on observations about the two most potentially destructive human creations ever, each having within its exclusive characteristic to cause “catastrophes that could wipe out all of humanity or, at least, devastate modern civilization.” Either of the two acting alone and left unimpeded could fulfill its nightmarish potential in due course. Those two Frankensteins-in-waiting are Anthropogenic Global Warming (climate change) and nuclear war. And to those, the members of the Republican Party either—on the subject of climate change—sneer at the overwhelming consensus of individual researchers and the esteemed agencies of NOAA, NASA, and many others based internationally, or—in the case of nuclear weapons—make frequent loose-lipped referrals and jingoistic threats to nukes as possible solutions to conflict, as did Sen. Ted Cruz did in recommending “making the sand glow” in combating ISIS; or the even more ominous suggestions to restart the arms race to add even further destructive power to those running the show. "The clock was initially based on the threat of nuclear conflagration only, but in 2007 was expanded to include other potential civilization-altering calamities including climate change, and cyber-and biological warfare. It was first set at 7 minutes before midnight, and has been reset 20-odd times in the last 70 years. 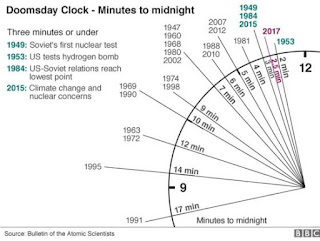 The furthest from midnight was in 1991 when the SALT agreement was signed by the U. S. and Moscow, soon followed by the dissolution of the Soviet Union. 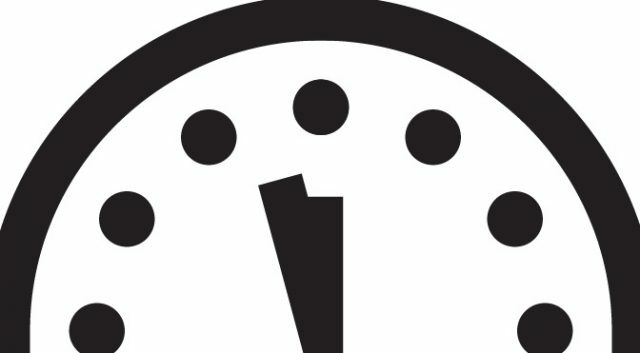 The closest it was moved toward the bewitching hour was 11:58—just two minutes shy—in 1953, when the U. S. tested its first thermonuclear device, followed in the same year by the Soviets." You would think Noam Chomsky was on the Board of Sponsors, having basically said much of the same thing two months earlier. Chomsky might wish, however, to rephrase his comment about the Republican Party to include the volatile and unknowable Trump as its leader as being a major factor in making his judgement. Such an amendment could change what seemed preposterous partisan hyperbole for some to an undeniable truism for all.